Amera Natural Nail & Health Care - natural products for today's lifestyle. Amera is the first company dedicated to healthy, natural nail and hand care. It was founded nearly two decades ago has continued to respond to the demands of today's consumers by offering an expanded line of personal care products. 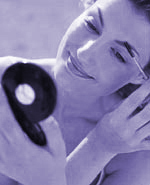 These include skin care, foot care, sun protection products, as well as a spa line, and many specialty products. Tired of having limp, lifeless hair? Well look no further! It's all in the name... Amplify is a unique volumizing system by Matrix formulated to provide extra volume, extra shine, and extra loooooong wear. Weightlessly adds volume to fine, flat hair, leaving it full of tremendous body and shine. Light and flexible styling products provide super strong hold and long-lasting styling effects. Aquage is an everyday product line for all hair types. Anywhere from normal to chemically treated hair, Aquage styling products are perfect for both women and men who just want to keep it simple and affordable. These are flexible products formulated to either complement each other in a system or to use individually. Warning: you must have a sense of humor to use these products! Bed Head by TiGi is a line of extreme products for extreme people!!! Perfect for both everday use or for special effects. But beware, this product is not for everyone. Fun and unique, wild and crazy! Bed Head is perfect for the wild and crazy "you" that everyone aspires to be. Some things never go out of style. Classic and affordable, Biolage by Matrix combines pure botanical extracts with special conditioners that leave hair shiny and silky smooth. Shampoo, conditioners, and styling products for all hair types formulated to achieve your individual style and add nutrient fixatives back into your hair. What you are left with is hair that is softer, healthier, and more manageable. If getting a lot for a little is your thing, this product line is right for you! Kenra has something for everyone, and is an everyday use product for the whole family. Add body and fullness with a unique formula of silk-protein enriched botanical extracts and panthenol cleansers. Helps to create body and fullness while maintaining color integrity. Restores strength and manageability to lifeless hair. If you have normal to "oh my what do I do" hair, Kendra can help! Edgier products made easier, let us show you the diversity of Matrix styling products. Versatile materials that let you manipulate reality. Create either soft illusions or distressed effects. Blow-dry your hair silky straight for that slinky, sensuous look or rough up your texture, mess, separate or chunk, twist it, shatter it, reshape it, betray it. Mix your style, remix it, make it yours with Matrix. Awesome color choices with long wearing durability.